Neck pain is very common, and affects up to 86% of the population, according to Hoy et al., 2010. It is also interesting to note that higher income countries have a higher prevalence of neck pain, similar to that of lower back pain. Financial costs associated with NP are high (Borghouts et al., 1999; Mäntyselkä et al., 2002) with fewer than one third of patients experiencing complete resolution of symptoms (Côté et al, 2004). Furthermore, there’s a high statistical correlation of patients with neck pain also having back pain (Okada et al., 2011), and vice versa. Although massive research on neck pain problems, there are however no promising guidelines with regards to its treatment. Many are told to simply stay active, and that the pain will subside on its own. Yet, studies show that it often does not, as only 30-60% of patients have statistically resolved their ailment after one year. There are however ways to resolve neck pain for good, and aiding in identification and treatment of the dysfunction is what this article is about. As the years go by, I am increasingly appreciating the fact that aetiology of neck pain is greatly multifactorial, and one that needs to be addressed as such. Sagittal alignment of the spine, temporomandibular dysfunction, scapular dyskinesis and more have been shown to be associated with neck pain, and I will explain the causes of this from my perspective, as well as much of the relevant research available. Due to the broad spectrum is potential triggers for neck pain, it may be a difficult problem to find the root cause of. It is very important to, firstly, be aware of the common factors that are contributing to the problem, if one is to be able to resolve it. Granted, the scientific evidence with regards to evidence is extremely conflicting. I’ve had no other choice than to use the quotes that best match the causes of common neck pain disorders, as I see it. We know that the scapula, cervicothoracic alignment, dental occlusion and and even psychosocial factors are associated with neck pain. But most of the time, addressing just one of these aspects will not resolve the problem. It must be dealt with in an integrated approach that addresses all of these factors. As I see it, it all starts with poor posture; misalignment. It is, at least [was] until very recently, generally accepted that posture will affect both general function and pain levels. Many studies, also recent ones, clearly show these associations, but the data is as most of you know not conclusive. The main goal of this article is to outline what I consider the main factors for these problems, how to identify-, and how to treat them. These four elements, depending on severity, may contribute to a tremendous amount of secondary dysfunction. It may sound too easy to be true, but in my opinion, the reason that this remains controversial is because the correctives that are implemented, often aren’t done so properly. Please keep an open, but reasonable mind and keep reading. As I said, structural alignment has become a very controversial topic the recent years. My definite impression is that the main reason for this, is vast lack of consensus with regards to what good posture really is, and how we can objectively measure it. When such criteria does not exist, it’s not hard to understand why many take a stand away from or even against postural correctives. In my opinion, many of the current postural practices follow dogmatic rather than objective teachings (I recommend reading my article on the fallacious anterior pelvic tilt, for more specific information on this topic). But on the other side of the spectrum, we have an army of therapists who claim that pain is just in your head. Could the truth lie somewhere in the middle? As I see it, there are many possible pitfalls when doing structural work due to the great counterintuitive nature of the body. What appears to be true superficially, may not really be true, which may be causing the therapist to misinterpret what’s really going on. This may lead to utilization of faulty and even iatrogenic correctives, unfortunately. Several of these issues will be expanded upon in this article. Allow me to go into detail as to why the four above mentioned causes of neck pain were chosen. Many studies show conflicting correlation between degree of forward head posture, as well as degree of cercical lordosis (or loss of such), and levels of pain. The reason for this is that the degree of cervical protraction or retraction is not the main issue, unless clearly large. It is possible to maintain a proper, and improper flexion and extension pattern of the cervical spine, and vice versa; improper flexion and extension patterns, which involves postural collapse and loss of regional tensegrity. The muscles of the neck require tensegrity in order to properly activate; it’s all a synergistic system. If the patient has a habit of hinging at their spine, which is what I am implying by ‘collapse’, tensegrity is lost and tremendous muscular dysfunction may develop over time. In accordance with this, studies show atrophy and fatty infiltration of the cervical musculature in patients with neck pain, especially those who have been whiplash injured. Also in accordance, studies show that both patients with high and low cervical lordotic curvatures may be affected by chronic neck pain. Cervical hinging may most frequently occur at the lower cervical levels if the patient is slouching forward with the head, and more frequently occur at middle or upper cervical levels of the patient is in cervical extension. Low cervical hinging will often develop a Dowager’s hump proximal to the level of dysfunction, if severe. Either way, hinging at the cervical spine may cause wasting of the regional musculature, which may lead to chronic headaches, atlas instability, migraines, thoracic outlet syndrome, temporomandibular joint disorder, and of course disc herniations. The headaches usually develop secondary to muscular dysfunction. This is easily testable, by squeezing into the respective muscle. If it reproduces the headache that the patient has been having, it requires strengthening. As mentioned, studies show decent correlation between cervical muscle atrophy and/or fatty infiltration and neck pain. In accordance, studies show that there is higher activity of the upper trapezius, for instance, in ‘good’ postures. Strong muscles are healthy muscles; weak muscles are usually painful muscles. Hence, high muscle activity isn’t a predictor of pain; weakness, inhibition and atrophy is. Atlas instability is yet another very controversial topic, but one very real. Atlas instability occurs as the tensegrity of the upper cervical spine is lost. When axial rotation of the I have covered this in depth in my atlas joint article; it is simply a topic too grand to expand upon here. This article also shows why upper cervical dysfunction is often associated with Temporomandibular disorder. Migraines, again controversial, is of vascular origin. Although this claim has been challenged in later years as an issue of idiopathic trigeminovascular dysfunction, I have no doubt that the first-mentioned aetiology is correct. Neck hinging may cause the internal jugular vein to partially occlude due to pressure agains the C1 transverse process, which may cause craniovascular hypertension. Furthermore, neck hinging will also cause thoracic outlet syndrome, which restricts blood flow in the vertebral artery, leading to migraines. I’ve covered these topics in detail in my migraine article; it is, yet again, too great to expand upon in this article. Thoracic outlet syndrome will the controversy revolving around neck pain ever end? Thoracic outlet syndrome is perhaps one of the utmost controversial diagnoses. However, this beast is very real, but it’s treatable. Due to stress, clavicular depression, poor breathing patterns and neck hinging, the scalenes may atrophy. This will usually lead to entrapment of the thoracic neurovascular bundle within the interscalene triangle. Studies show that TOS may cause vertebral artery flow restrictions, which is its connection to migraines. Once again, a topic much too great to expand upon here; read my thoracic outlet syndrome article. The disc herniations and cervical stenosis will usually appear at the levels at, or adjacent to the hinging vertebra. These disc herniations virtually always protrude posteriorly, which many biomechanical studies have shown that can only be caused by spinal flexion. This is why we see posterior disc herniations occur even when the patient seemingly has an adequate lordotic curvature. Furthermore, cervical hinging may jam the facet and uncovertebral joints together, over time causing malformation and stensosis. Development of stensoses may be ceased by optimizing cervical structure. You may view a lot of research regarding disc herniations and its aetiology in my anterior pelvic tilt article, which was linked further up. Although it may seem like a minor thing, continuous, habitual depression of the scapuloclavicular structures may lead to several significant musculoskeletal disorders. Proper scapular height has been shown to be between the T2 and T7 (Sahrmann, 2002), and a depressed scapular positioning is quite frequently seen in patients with neck pain. The reason that the scapulae depress in the first place, is usually due to a swayback type of posture where there is an anteriorly translated pelvis and large thoracic kyphosis, i.e poor strutural habits. Significant rounding of the thoracic spine will make up a poor foundation for both the scapulae as well as the cervical spine, not to mention muscular dysfunction. First of all, when the upper thoracic spine and shoulder drops, the musculature attaching between the neck and the shoulder will inhibit, weaken, and ultimately atrophy. This will often cause restricted cervical movement, headaches, and pain. It will usually also cause scapular dyskinesis. Furthermore, as the shoulders drop, the neck will be pulled into hinging, usually at the lower cervical levels. This will, as mentioned already, promote suboptimal compressive forces onto the intervertebral discs, uncovertebral and facet joints. It will also cause restrictions to occur at the middle and lower cervical levels, promoting excessive movement at atlas joints, something we definitely do not want. Scapular dyskinesis has been associated with neck pain and cervical muscular dysfunction. If we look at the above picture, where the scapula is situated extremely depressed bilaterally, it’s quite obvious that the muscles such as levator scapulae and trapezius aren’t working at all (although falsely appearing to be large, this curvature is the oval shape of the thorax, and not a large trapezius!). As you may know, these muscles are commonly associated with cervical pain and headaches. Furthermore, on a sidenote, such scapular positioning will also commonly lead to glenohumeral dysfunction and pain, as the glenoid will be unable to track the humeral articulation, leading to scapular downward rotation during glenohumeral abduction and anterior scapular tilt during glenohumeral flexion, which causes impingement. Between the clavicle and first rib, passes the neurovascular bundle of the thoracic outlet: The brachial plexus, as well as the subclavian artery and subclavian vein. This passage is called the costoclavicular space. Significant depression of the clavicle, either posturally or during certain movement patterns, may cause the clavicle to jam the brachial plexus, as well as the subclavian artery and vein into the ribs, crushing them. This may produce tremendous neurogenic pain syndromes of diffuse nature in the neck, shoulders and arms, as well as cold hands, venous insufficiency and so on. Furthermore, when the clavicle is jamming into the first rib, apical (vertical) expansion during inspiration will become restricted. If the thorax isn’t able to expand vertically, the scalenes will usually inhibit, contributing to thoracic outlet syndrome. As one can [hopefully] start to understand, living in these postures can promote a lot of dysfunction, even to the extent of causing disability for certain, more extreme individual circumstances. It is of utmost importance to identify and correct these problems, in my experience. Swayback posture is a postural dysfunction where the pelvis comes anterior to the thorax. This is perhaps the most important things to consider when treating neck pain, because an anterior pelvis will cause the thorax to fall round as it falls backward, and the neck and shoulders to come forward in order to maintain center of mass. Degree of thoracic kyphosis was shown to be one of the greater correlating factors vs. neck pain, as cited earlier. Thus, if the swayback posture remains unaddressed, it is very difficult to get results, and especially lasting results when treating neck pain, as correcting the neck and shoulders alone will be a direct attempt to destabilize the body by putting it off center of gravity. Such an attempt will, of course, not be successful. We need to cooperate with the nervous system, not oppose against it. By addressing the pelvic position first, it will be easy to correct the thoracic, cervical and scapular positioning. As stated, I strongly believe that this occurs due to a chain reaction when the pelvis comes forward. It is my impression that this is one of the most overlooked contributing factors when dealing with neck pain. This topic, I reiterate, is perhaps the most important one of this article. But, because it’s so controversial and even seemingly cliché (because postural work is usually done wrong! ), I wanted to get some research and common sense ‘into the room’, first. I truly consider it of paramount importance to treat swayback posture. It’s easy to do, and in my experience yields very good and lasting results, when done properly. On the same coin; a few research papers have noted the association between neck and lower back pain, and I am convinved that swayback posture is the main reason why. It is very accepted by now, that stress has a high correlation to pain in general. Neck pain is no exception. I do not necessarily agree, however, that stress alone is the trigger of most pain syndromes. My experience is that stress will exacerbate, amplify, any underlying condition. Think about it; why is it that some people ‘always’ get back pain when they stress? While others, they get jaw pain, or hip pain, or headaches, when they stress. While, again, others may get knee pain or chest pain. Is it really the stress, or is stress often ‘just’ an amplifying factor? For instance, if you have a breathing disorder, stress will almost undoubtedly make this intermittently worse. As I have mentioned, many muscles of the shoulder and neck are involved in breathing, especially apical expansion. The trapezius and levator scapulae should phasically elevate and lower the clavicle during respiration. The sternocleidomastoid and scalenes, as touched upon, will raise the sternum and ribs cranially. As will the pectoralis minor, if the scapula is stable. If the scapula is not held in proper position by the trapezius, the pectoralis minor will, rather than expanding the chest, depress and anteriorly tilt the scapula. Hence, stress may affect muscular function. This is why it’s so important to be aware of what we do when we stress, and not just the stress alone. Now, I have also seen stress be the main trigger for serious, chronic pain, especially nerve entrapment syndromes. Althought not in the scope of this article directly, I will address it briefly. In my experience, a lot of severely stressed out patients have a tendency of bracing, i.e clenching their bodies. Some do it constantly, all day long. This may cause a significant amount of muscular dysfunction. This massive muscular dysfunction will in turn cause pain, but its underlying cause is stress. However, this is not something I see with the common neck pain sufferer. It’s almost exclusively seen in patients with severe nerve entrapment issues, in my experience. You can read more about this topic in my lumbar plexus compression syndrome, thoracic outlet syndrome (already linked above), and chronic muscle clencher articles. Such a patient will be required to, not only reduce their stressors, but also learn how to relax their bodies and stop clenching 24/7. As explained throughout this article until now, there are many possible causes of neck pain. Because of this, a thorough examination is necessary in order to identify the cause of the pain. Moreover, most neck pain sufferers also have frequent headaches. I will outline a protocol to identify the cause of the these as well. Thoracic outlet syndrome, scapular dyskinesis, atlas misalignments and similar difficult topics are also highly important aetiologies that must be considered. I can not detail all of these in this article, as stated, but I’ll write down enough info to guide you into the right direction. The spinal discs are a relatively common source of cervical pain. Plenty of biomechanical studies show that flexion cause posterior migration of the nucleus, eventually delaminating the annulus fibrosus and resulting in a disc herniation. The intervertebral discs have rich innervation, and although many claim that discs aren’t a reliable source of pain, a lot of people (and research papers) could argue otherwise. Irritation such as malcompressive forces imposed on the disc, can and will often lead to pain. Therefore, discogenic pain may occur without presence of nerve root compression. Just like it would hurt when someone punches you in the face (it can’t be proved on MRI), malcompressive forces imposed on the disc may also produce pain, although no evidence of injury may be present on MRI scan. After all, isn’t it well known by now that the brain will sense ‘danger’ prior to injury, to avoid injury? Yes, it’s a controverisal topic, as always with neck pain, but in my experience, there’s no doubt that discs can cause a lot of pain. Discogenic pain is definitely real. Discogenic pain, or even a disc injury, is caused by uneven vertebral loading angles and poor support from the surrounding muscular system. Both of the latter issues are caused by hinging postures, as I explained earlier. We do not want excessive retraction nor protraction of the head and neck, of course, but identifying the cervical hinging is the main priority. The neck is not as ‘vulnerable’ to flexion as the lower back, because it carries significantly lower loads. It will be more sensitive to protraction (without hinging) if the muscles are weak. Restoring relative alignment and regional tensegrity is the key. Look at the patient’s posture. Is he or she in swayback posture, with the pelvis in front of the thorax? Is there significant thoracic rounding? Are the shoulders forward or depressed? Is the neck hinging? Does it hurt to go into cervical flexion or extension? If there is significant cervical hinging, or obvious forward head posture, and the patient feels a centrally located pain when going into cervical flexion and/or extension, it is probable that this pain is of discogenic origin. Most cervical muscles, if significantly weak (note: weak, not just tight), may cause neck pain. They may also restrict normal cervical motion, leading to jammed facet joints, neck hinging, and so on. In such a case, it is very important to figure out why they are not working in the first place. Manipulating the neck or stretching/massaging the muscles will not resolve the situation; rather, it may exacerbate it. Generally, if there’s muscular pain in the cervical spine, you are quite likely to find postural problems. Hinging neck, forward pelvis and slouching shoulders are common causes of muscle imbalances, due to the reasons that I mentioned earlier in this article. Direct injury to the muscles could also cause them to become painful, such as whiplash injury. As also mentioned, studies show atrophy and fatty infiltration of the cervical musculature in patients with chronic neck pain, which is indicative of degeneration. This is why it’s paramount to understand that these muscles require strengthening and not more release work, which will only lead to worsening down the line. Granted, release work may be fine as a measure of acute pain relief, but must be combined with addressing the real causes if lasting results are to be obtained. Personally, I do not mind using dry needling or similar as an acute intervention to make the client’s day a little better, but I will not keep doing it again and again, by the reasons already mentioned. To identify whether or not a muscle is problematic, is not difficult. Usually the patient will already know where they feel the pain, and can point it out to you. They feel a deep urge to massage and stretch it, but the pain never goes away completely; rather it may return with a vengeance after release work. If they do not show you where it hurts initially, simply ask them exactly where the pain is located. When they point it out, use your anatomical knowledge to ‘guesstimate’ which structure might be affected, to have a base line theoretical approach. You will then carry on to do several tests in order to confirm or reject this. Sometimes, if no conclusive aetiological results can be made, an elimination approach may be necessary in order to exclude potential issues one by one. If the patient does not know whether or not they have muscular pain, you may use simple palpative measures in order to identify such. Strong and healthy muscles are relatively pain free to compress/squeeze (you’ll be able to discern between healthy/dysfunction quite quickly if you incorporate this approach into your practice), and they will have a natural fullness and tone when palpated. Dysfunctional muscles however, are usually extremely painful to squeeze into, even at moderate and light touch, and they will usually, but not always, have a thin and ‘mushy’ feeling to them. Once you identify such a muscle, you can confirm its weakness by performing a muscle test, or by trial strengthening. It’ll prove to be weak (if the respective muscle is exercised correctly), I guarantee it! This same approach will also work for identifying the cause of cervicogenic headaches. Squeeze into the muscle for 5-10 seconds with a moderate to firm pressure, and see if it produces headaches. If it does, the muscle is weak, and is responsible for the pattern of headache that occurs. Also, if it does, ask the patient if this is the same headache they’ve been experiencing. Often times the patient may be experiencing headaches from several sources. The few muscles I do tend to release, are the temporalis and suprahyoid muscles, as they tend to retract the jaw excessively and contribute to temporomandibular disorder, headaches, and even trigeminal neuralgia. I’ll get into this in a second. If none of the muscles reproduce the same headache that they’ve been having, consider migraines as the potential cause (cerebrovascular restrictions). Migraines can usually be triggered by putting the patient into the Dekleyn test position for the vertebral artery, or into significant hinging with extension, to compress the internal jugular vein against the transverse process of the C1. They may have to stay there for a little time in order to trigger it. Don’t do this unless you understand what you’re doing and have experience treating the upper cervical. If symptoms similar to vertebrobasilar insufficiency appear, consider having their neck vessels examined radiologically before continuing treatment. More about this in my atlas article. You can also do movement testing to identify the cause of the neck pain, for example if there is restricted cervical movement. If passive elevation of the scapula helps, the levator scapulae or trapezius is likely involved. If passive elevation with anterior tilt makes it better, the levator scapulae is most probably the main culprit. If passive elevation with posterior tilt helps more, the trapezius is more likely to be the main culprit. Of course, both are a symptoms of habitual scapular depression. Furthermore, if rotation towards the right causes left neck pain, it’s probably the left levator scapulae. If it causes right neck pain, it’s probably the right trapezius. And vice versa. The levator scapulae is an ipsilateral cervical rotator, where as the trapezius is a contralateral cervical rotator. Moreover, the scalenes may jam up the neck as well. If rotation is increased in cervical flexion, the scalenes are likely to be the cause, as they are relaxed in flexion. If cervical flexion makes it worse, it’s more likely to be the scapular elevators that cause the pain/restriction. This can be confirmed by simultaneously depressing the scapula further, to see if this increases degree of restriction. When doing the kinematic testing, make sure that cervical rotation is performed in an axial manner. Hinging must not be permitted. As explained several times now, scapular dyskinesis may greatly affect the neck and contribute to both neck pain, shoulder pain, headaches, upper cervical laxity, and even thoracic outlet syndrome. It is therefore important to be able to examine the muscles as well as the position and movement of the scapula, in order to estimate whether or not they are a probable causes of the symptoms that the patient is experiencing. The first step is to evaluate the general posture, as mentioned in the discogenic pain section. Are the scapulae winging? Are they situated below the T2 vertebral level? Does the patient get neck pain or headaches after loading the arms or working over head? Does painful restriction occur during cervical rotation or flexion? Are they resting in downward rotation? Are the trapezius and levator scapulae muscles very thin and/or painful to touch? Do they produce headaches when squeezed for 5-10 seconds? Does the scapula protract and rotate posteriorly and medially during glenohumeral flexion, and retract, rotate upwardly and laterally during glenohumeral abduction? Does the scapula and clavicle depress when the arms are loaded? If not, will they if you increase the weight of the load? Is there evidence of costoclavicular space compression? Etc. All of these questions will help you to make up your mind of whether or not the scapula is contributing to the issues that the patient is having. Generally, if the scapula is involved in the dysfunction, it will be conspicuously resting in depression and downward rotation at a first glance. This is a good place to start, especially if you feel insecure about evaluating and treating dyskinesis, which may be quite complicated. You may also have the patient raise their arms to 90˚ of both flexion and abduction, and see whether or not depression of the scapula occurs, which it should absolutely not, as it is indicative of dysfunction of the scapular elevators, which will often lead to neck pain. As you may understand from the questions, this topic is large. However, understanding scapular mechanics and how to treat it, is paramount in order to become skilful at treating neck pain with long term results. Confer with my scapular dyskinesis article. Nerve entrapment syndromes are relatively common, but because [mainstream] diagnostic criteria is lacking for these issues, they have become quite controversial. I did quote several studies regarding thoracic outlet syndrome earlier, which is a very common aetiology (varying in severity), believe it or not. Thankfully, it may also be relatively easily identified, with the same provocative testing techniques as I outlined above. Other common and uncommon craniocervical neuralgic syndromes include occipital trigeminal and auricular neuralgia, etc. Good questions are an important aspect of identification. Nerve pain is usually of diffuse nature, and may come in different forms of pain-types. It’s usually spreading over an area, and may be perceived as aching, lightning, radiative, numbing, and so on. Also, it will usually not ‘fit’ with typical muscular pain, as it is regional. Ask specific questions in order to guide you toward the most proabable cause. Knowledge of the nervous anatomy is necessary in order to quickly identify the dysfunction. If your knowledge on this topic is limited, ask good questions and use anatomy books in order to see if any focal nerves fit with what the patient is experiencing (this approach is also beneficial if one does have good neuroanatomical knoweledge). From there, find out which muscles the nerve courses next to, or through, in order to plan where to direct your provocative testing and which muscles to treat. Nerves, similar to muscles, should be pain free to compress manually. It is a great, misleading misconception that nerves are always painful to touch or squeeze into, and this is causing a lot of practitioners to miss important causes of pain. If a nerve is painful to compress manually, there is irritation imposed on that nerve, usually stemming from a proximal or focal site. In my experience, degree of pain (or lack of) upon pressure, usually correlate with the patient’s symptoms. Outline protocols for identification of these issues in great detail in my TOS, LPCS and atlas articles. However, I will briefly write down the most common patterns of pain and how to identify it. By squeezing into the interscalene triangle, you are squeezing directly into the brachial plexus. In healthy patients, this should be pain free. The greater the pain upon manual pressure, the greater the likelihood of them having [severe] thoracic outlet syndrome related symptoms. The pain may or may not spread. It can spread into the neck, periscapular area (dorsal scapular nerve), down the arm, into the chest (medial and lateral pectoral nerves), etc, even into the autonomic plexus via the white and gray ramus communicans. Even if it does not spread, hypersensitivity (patient jumping on the table due to pain) is a positive indication of neurogenic irritation. Also, not neuralgia, but it is beneficial to be aware of: As I’ve mentioned briefly in the beginning, that thoracic outlet syndrome may restrict blood flow in the vertebral artery. This has been shown in several papers, and also been correlated with migraine headaches. Thus, considering TOS when treating migraines is very important. I do not think I’ve seen a single migraine patient who didn’t have signs of TOS (and also, who didn’t hinge at their neck). Read my migraine article for more information on this topic. Moreover, the vagus and sympathetic ganglia may also be affected. The vagus nerve can become entrapped between the anterior scalene and clavicular portion of the SCM, while the superior cervical ganglion may become entrapped between the alar fascia and longus capitis / longus colli muscles. Just squeeze into them (go behind the carotid artery, not into it. If you’re not sure how to do that, don’t use this approach). Symptoms of entrapment are tinnitus, dizziness, fullness / cloggedness of the ears, coughing, hiccups (phrenic nerve), poor eye focus, and more. These symptoms aren’t always appearing during the provocative testing, but will often exacerbate initially when exercising the causative muscles. If thoracic outlet syndrome is likely based on the provocative tests performed as well as other findings, a series of corrections will need to be done. Read more about this in my thoracic outlet syndrome and atlas articles. Identifying costoclavicular space compression syndrome (CCSC) is very important, as it involves the brachial plexus being crushed by the clavicle into the first rib. This is not necessarily a more painful pathology than TOS (they are often seen together), but osseous compression of the nerves may in extreme circumstances cause significant nerve damage, where as muscular entrapment is unlikely to cause significant damage. I have seen patients whose years of extreme neuralgic symptoms in neck, chest and arms have been eliminated by mere postural correctives, in a period of just a few weeks. This may seem absurd, but if you can imagine the brachial plexus being compressed between two bones, decompressing these structures can and will result in almost immediate improvement. Most often, the interscalene entrapment is the greatest problem, and there is simultaneous mild to moderate compression of the costoclavicular space. Less common, but not uncommon, is costoclavicular compression as main cause of pain. Sometimes identification of costoclavicular space compression may be difficult, as the provocative test is not always positive, even when the issue is present. The provocative measure for costoclavicular space compression is to push the clavicle hard caudally, when the patient is seated, to force compression of the brachial plexus and vascular bundles. You may have to push it down for 10-20 seconds and wait to see if symptoms appear. Conspicuous symptoms are highly indicative of CCSC. Other signs that are indicative of possible CCSC is depression of the clavicle in posture, especially if it’s very low. Furthermore, inability to prevent clavicular depression during loading of the arms is also an important indicator of probably CCSC. If symptoms of CCSC are identified, scapular habits must be altered. This is outlined in my scapular dyskinesis article. Entrapment of the Cruveilhier’s plexus, i.e the posterior cervical plexus, especially the occipital and auricular nerves, is sometimes seen when there’s significant upper cervical dysfunction. Often seen in patients with atlas instability, but it may also affect patients with general neck pain. The greater occipital nerve passes through the suboccipitals, semispinalis capitis and finally the upper trapezius. Dysfunction, i.e significant weakness of these muscles may lead to its entrapment, and consequent pain. The greater auricular nerve passes emerges between the clavicular head of the SCM, and the anterior scalene muscles, at a passage called Erb’s point. Once again, significant weakness of these muscles may cause entrapment of the nervous fibers. 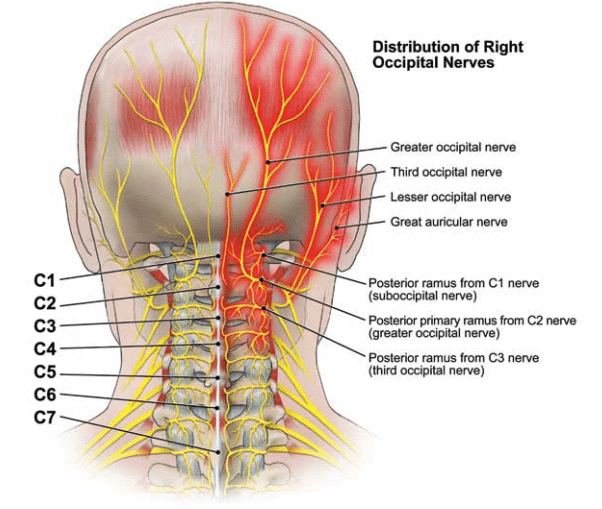 Squeezing your thumb into the Erb’s point or Cruveilhier’s plexus may prove to be extremely painful, and is most likely indicative of nerve entrapment if the patient has been experiencing symptoms that are similar to those of occipital or auricular neuralgia. Will the controversy ever end? Upper cervical dysfunction is quite common in long standing neck pain sufferers, and especially whiplash injured patients. However, because poor diagnostic criteria exists to identify these problems, many patient’s pain remain seemingly idiopathic. I propose a very simple way to evaluate the alignment of the atlanto-axial and atlanto-occipital alignment. I do not agree with the spring tests as they do not tell us nothing about jointal torsion, nor which muscles are causing it. Because jointal alignment is not identified, it’s almost impossible to know which muscles to treat. Joint manipulation to «unlock» the joint in order to pass the commonly performed spring testing, will absolutely not – not at all – address nor correct the underlying condition of atlantal laxity. The C2-3 spinous processes should be aligned longitudinally. Furthermore, the C1’s transverse processes should reside directly underneath the apex of the mastoid processes. Atlantoaxial torsional hyperlaxity is difficult if not impossible to identify by palpative measures. It may be diagnosed by MRI or equivalent with the head rotated maximally to the right and left. Its presence may however be ‘guesstimated’ based on poor cervical function and thin upper cervical musculature, in comparison with the patient’s symptoms, as outlined in this article. The A-A joint has approx. 50˚ of innate rotational movement. Lateral gliding can be measured by comparing the lateral edge of the mastoid process and the tip of the C1 transverse process. You are then looking for lateral occipital translation and not torsion. Small human osseous anomalies must be accounted for, but seeing as a 3cm leg length discrepancy is relatively rare and considered very large, although it’s just a approximately 5% of an average leg length, it’s reasonable to suggest that such an anomaly, at the vertebra that holds the cranium, is not greater than mere 1-3 millimeters in the utmost generality of circumstances. Currently, as far as I know, no landmarks for measuring the atlanto-occipital joint’s alignment exists. These measurements that I here propose have been performed on hundreds of patients, and are virtually always in alignment (as described) if there’s no significant neck dysfunction. Whiplash injured patients, especially those who were injured years ago, very frequently have atlanto-occipital torsion. There are a few clinics that measure atlantoaxial hyperlaxity, however, for example an upright MRI center in the UK. I will not address further details with regards to identification nor correction of the atlas joints in this article; you will have to review my atlas article. TMD is not a neck pain problem, but because so many patients with neck pain also have jaw pain, I will briefly address the cause of this problem. TMD occurs when the maxillary bone has not been properly developed, usually due to improper tongue posture and mouth breathing during childhood. When the maxillae is underdeveloped, the bite will be established too far back, causing the mandibular condyle to also rest too far back. If sufficient maxillary dysmorphia is present, the condyle will be so far back in resting position, whether the mouth is open or closed, that it shears into the temporal glenoid cavity. This is what causes TMJ disc injuries and subluxations; direct mechanical compression. Forward head posture may exacerbate the compressive forces within the TMJ, especially in mouth breathers, as the suprahyoid musculature will tighten as the head comes forward and pull the mandible further posteriorly, increasing shear forces within the joint. TMD can cause severe pain, locked jaw, migraine-like headaches (trigeminal neuralgia), jaw clicking, and lots of other issues as well. It may, however, easily be resolved by altering mandibular position in posture, relearning natural opening and closing mechanics of the jaw, and exercising the muscles that cause mandibular protraction (as it decompresses the TMJ). Once the TMJ is decompressed, the joint can and will heal. Trigeminal neuralgia is a relatively common bi-symptom of temporomandibular disorder. The auriculotemporal branch of the trigeminal nerve may be compressed between the temporal bone and the mandibular condyle, often leading to debilitating symptoms. The lingual and buccal branches of the TN may also be entrapped within the lateral pterygoid muscles, if they are weak. And they are often weak in patients with TMD, for reasons that you may read about in the temporomandibular joint disorder article. To identify trigeminal neuralgia, squeeze the tip of your thumb into the divot between the mandibular condyle and the temporal bone, i.e straight into the auriculotemporal branch. This test is almost always somewhat painful, but you’ll be able to distinguish between, even with little experience, those patients who scream in pain and those who don’t. The greater the pain upon provocative testing, the higher the likelihood of legitimate trigeminal nerve compression. It’s hard to do provocative testing on the pterygoids, so a few trial days of pterygoidal exercising will show whether or not symptoms compatible with trigeminal neuralgia appears, presuming that the patient is doing the exercises correctly. If it does, keep strengthening the pterygoids. On the same coin; irritation of the trigeminal nerve may also cause tinnitus. Once again, you may read more about this in the TMD article. Now, as we have been introduced to the many possible aetiologies of neck pain disorders, as well as how to approach in order to identify them, let us discuss treatment. As I mentioned, I will not address treatment of the atlas, thoracic outlet syndrome, scapular dyskinesis nor temporomandibular disorder in this article. If signs of these issues are identified, confer with the the linked articles. What I will address is which structural corrections, as well as exercises that are required to be performed given the different situations, and of course how to do them. Generally, this will revolve around posture correctives, discogenic pain, disc herniations, headaches and craniocervical neuralgia. I hope that I have made it clear by now, that without good structural habits, a few exercises that you do for 5 minutes per day won’t resolve chronic pain and dysfunction. We want our structural habits and our exercises to aim for the same goal, i.e promote the same result – logical, isn’t it? The patient has to be cued out of their dysfunction, and then stay there, forever. It’s not a temporary alteration, but a permanent one. True postural correctives are very demanding on the patient, and the therapist must be adamant when conveying the correctives as well, or else the patient is unlikely to actually do them. A thorough explanation of how, and why, must be done. With relations to neck pain, as I’ve said, getting the neck out of «hinging», and raising the clavicles are probably the most important aspects. However, and I reiterate, a forwardly shifted pelvis and excessively kyphotic thoracic spine may often prevent the success of the formerly mentioned correctives, if present. Therefore, if swayback posture is identified, it must be corrected first, or in a parallell manner. A forward pelvis, i.e swayback posture, is corrected by pulling the client’s pelvis back and up, that is posterior translation with anterior tilting, in order to re-engage the spinal erectors, and telling the patient to stay there, which implies to learn how to stand and walk in that alignment. This will also relieve low back pain (although it may hurt initially, which is fine and normal. Read my simplified lower back article or the anterior pelvic tilt article that was already linked earlier). Once the pelvis is set in proper position, which is anywhere except infront of the thorax (I am exaggerating a little, but you get the point), it will be tremendously much easier to correct the alignment of the thoracic spine, neck and shoulder girdles. Teach them to pull the back of the head toward the roof and slightly tuck the chin, while also slightly extending the thoracic spine. The thoracic spine is naturally kyphotic, so make sure not to over-correct it into complete flatness. This will activate the thoracic spinal erectors, deep neck flexors and cease all cervical hinging, as mentioned in the video further up. Simultaneously, we also want to gently elevate the clavicle in order to posturally engage the trapezius, if the scapula is situated lower than the T2 vertebral level. The scapula should rest in 0-5˚ of upwrad rotation; never in downward rotation. It may rest in slight anterior tilt. Thus, both the scapular height and its alignment must be addressed. It is extremely important that the trapezius is active in posture, as it is a very strong muscle. It is the main lever of the scapula, preventing its depression during all kinds of lifting. If it doesn’t work, the neck will usually be pulled back into a hinging pattern, and thus results will not last. Moreover, it is important to emphasize that these correctives are not simple, and it requires a lot of effort from the patient, but it’s 100% doable if the patient really wants to get well. They just need to believe in it in order to actually do it. In addition to optimizing static structure, we need to address a few common problems that subsequently develop from living with dysfunctional structure (I can almost hear the pain science crew screaming when I say that). Most patients who hinge at their necks are unable to extend the craniocervical junction by utilizing the suboccipitals. This will cause them to hinge at their necks every time they are looking up, which is extremely detrimental to upper cervical stability and function, as well as the vertebral facet joints and intervertebral disc at the level of hinging. It is therefore imperative to address this issue in addition to general structure. Common indicators of improper occipital extension, are atrophied suboccipitals and upper cervical extensors. Virtually definite indicators are atlas joint torsion and forward A-O translation, for the reasons mentioned earlier, as well as below. The cranial portions of the trapezius will usually also be atrophied. Of course, a strong suspicion must also be made if the patient is hinging at their cervical spine in posture. Atrophy of the suboccipitals along with poor axial cervical integrity, may lead to atlantoaxial and atlanto-occipital instability, torsion and/or translation, as excessive motion must come form the upper neck, and worsely so, without the incredibly important co-activation and support from the suboccipitals and longus capitis musculature, which holds the joints synchronized during craniocervical articulation. To find out whether or not they are able to extend the neck symmetrically, put them into a «long neck» position by tucking the chin gently and pulling the back of the head up to the roof, and show them how to gently extend on the the occiput in this position, as shown in the video below. You may also assess them by asking him or her to axially rotate their head to both sides without getting into a hinged position. Most are able to perform the rotation, but not the extension. Ask them, though, whether or not this way of rotation felt normal for them. If it didn’t, and it’s likely not to, have them show you how they usually do it. Once an improper cervical rotation or extension pattern has been identified, it is very important to re-learn proper mechanics and incorporate these into the patient’s movement pattern. This can be very difficult for some patients, less so for others. It will require practice. If the patient can perform the proper movements relatively simple, they can start to incorporate these patterns into their daily life immediately. However, patients with severe and/or long standing dysfunction, may often use several months to learn how to extend the spine without hinging. Patience and daily practice is imperative. Once the muscles that are causing pain are identified, you first of all need to find out why they are weak in the first place. Whiplash? Depressed clavicle? Scapular dyskinesis? Posture? And so on. I did explain this already, so I won’t go into it again. It is extremely important to understand, however, that we must address both the causes and the symptoms. This is a winning strategy. Weak muscles are often painful muscles, where as strong muscles are healthy, because they are able to cope with the stress that is imposed on them during general activities. Weak muscles, on the other hand, will become painful when overloaded, and this may happen with even the slightest resistance depending on degree of weakness, especially in whiplash injured patients. Unfortunately it is common practice to release painful muscles on a periodic basis. I am aware that this practice is done with good intentions, and trust me when I say that I have done this myself too, however it is now well proven world wide, that massaging painful muscles only will give temporary relief. It always comes back. But why is that? Because the muscle is, in fact, weak! We can not massage / needle / stretch away weakness; we must ‘exercise-away’ weakness. I have written extensively about this topic in my lumbar plexus compression syndrome and thoracic outlet syndrome articles. The reason why so many keep getting massages, is of course that they have tried strengthening and it just makes them worse. However, it is important to logically reflect on this: If a muscle gets painful after being exercised, doesn’t that imply that it’s not being able to cope with the load? I.e, it’s WEAK? Yes, it does imply that. And that is also what’s going on in virtually all of these scenarios! An extremely weak muscle will naturally have an extremely low work capacity. That’s just how it is. So, the way to resolve that is by gradually increasing its work capacity with specific, mild to moderate intensity exercises of high frequency. I will tell an interesting story about this very topic in the whiplash section below. But, when we assign homework for a muscle that’s been identified as dysfunctional, the patient must always start light. If they start light, and they do the exercise correctly (it should feel heavy for them, if not, they’re compensating with other muscles), they should get a mild exacerbation of the pain the day after, or after a couple of days. This means that they have done their exercise well, and is perfectly fine. We want to [very] gradually increase the muscle’s work capacity and strength. We must stimulate enough to get progress, but not so much that there is inflammation and regression. This is a fine line which is also very individual. Practice and trial and error is required in order to find it. But, what I usually tell the client is that they do their exercises either every day, or every other day, one or two sets until mild fatigue. If there’s mild exacerbation the day after, or two days after, they’ve done it correctly. Excessive symptoms means that they have trained too hard. Gradually increase in volume and intensity when it seems natural to do so, based on symptoms and strength gains. You want to aim for a gradual increase in strength, endurance, and thickness of the respective muscle. As the muscle gets better, it’ll gradually hurt less and less to perform provocative testing on it, i.e squeezing it. Once it’s healed, which implies that it is now of adequate strength and integrity, it will barely if at all hurt to perform provocative testing on it. Also, I usually prescribe the exercises bilaterally, even if only one side is the patient’s complaint, as both sides tend to be positive with regards to provocative testing. Use discernment when prescribing exercises. AND ALWAYS PERFORM REHABILITATIVE EXERCISES VERY SLOWLY TO AVOID COMPENSATION. Be sure to start very carefully with some of these exercises, especially the suboccipitals and the scalene complex, as they may produce tremendous debilitating pain if exercised too hard, too fast, too soon. As mentioned, 5-10 repetitions, one work set, for a trial of 3-4 days, is usually a good way to go about when initiating treatment of severely dysfunctional tissue. When treating whiplash patients, be extremely restrictive when assigning exercise volume, as it often takes months to get up to what is normally low levels of strength and endurance. More on this in the whiplash section below. Don’t clench the abs nor suprahyoid musculature while performing this exercise. Some cheating may be inevitable in the beginning, though, which applies to all of the exercises. Make sure that the patient isn’t in forward head posture, as this will inhibit the craniocervical portion of the upper trapezius. Pull the shoulders straight toward the back of the head. The upper trapezius muscles are often severely injured and atrophied in whiplash patients, and must be stimulated carefully and properly in order to heal. You may also strengthen the middle trapezius by leaning somewhat more forward. Always perform this exercise bilaterally, no exceptions, as it may alter atlanto-occipital alignment, in patients who are susceptible to, or have atlas joint instability. Avoid neck hinging at all costs while performing this exercise. Avoid clenching the suprahyoids and abs while performing this exercise. Avoid clenching the suprahyoids while performing this exercise. Use very low force from the hands, in order to disengage unwanted muscles (compensations). Avoid clenching the suprahyoids as well as ‘jerking’ with the abdominal obliques while performing this exercise. A slow motion is mandatory in order to obtain adequate stimulus. If signs of craniocervical neuralgia is detected or suspected, this may be both confirmed and treated by strengthening, as almost all nerve entrapment issues will exacerbate before they improve. This is because the muscle that is entrapping the nerve is weak, and has a very poor work capacity. It will be somewhat irritated initially (ranging from 1 week to 6 months, depending on many factors) when it’s forced to go back to work. Nerve entrapments generally occur in weak muscles because of the buildup of connective tissue that subsequently develop, seemingly as a response to weakness. Also, please note that muscles in which nervous plexuses pass through, such as the scalenes or psoas major, are generally much more difficult, painful and slow to rehabilitate, and may therefore be a true struggle for the patient to get through, although the prognosis is great if they are able to keep their spirits up. Muscles in which only a few nerves pass through, are generally much easier to rehabilitate. Not much of a fighter’s spirit is needed for the latter scenario. The buildup of hyaluronic acid within the thickened fascial tissue will cause restricted fascial gliding; it becomes rigid. Therefore, nerves that emerge adjacent to or through the vulnerable and weak structures, are in my experience tremendously more susceptible to nerve entrapment syndromes, as friction occurs when the nerve is unable to freely glide between the tissues during movement. What I have also seen, time and time again now, is the same principles as noted above. Massaging will temporarily cause improvement, but over time (if continued), exacerbation. Strengthening on the other hand, will first increase the level of pain, but once the muscle gets healthier and stronger the pain will completely resolve with long lasting results. The provocative tests will also no longer be positive. Thus, identify the structures that the affected nerve(s) is passing through, and strengthen them. I did outline most of the common entrapment sites earlier, in the neuralgia section. For thoracic outlet syndrome, that is amongst others the scalenes. For the cruveilhier’s plexus, the suboccipitals and upper trapezius, mainly. For the trigeminal nerve, amongst others, the pterygoids. Etc. Be creative, it’s not that difficult once you know that massage is futile and that strengthening is the key. Many whiplash injured patients have tremendous neck pain and headaches of diffuse nature. The difference between whiplash injured patients and «normal» neck patients, has been shown to be a higher degree of fatty infiltration in the cervical musculature. This occurs as a result of the stretch injury. The approach to identifying the cause of the patient’s pain, is no different than with the ordinary neck pain sufferers. Posture, provocative testing of the muscles, etc. However, what is different with these patients is that they have literally damaged their cervical musculature, rather general atrophy caused by habitual inhibition, which is usually the case with the non-WAD neck pain group. It is very common knowledge that when treating a muscle strain, this muscle needs specific eccentric strengthening. All football players know that if they stretch a hamstring or a calf, this is what they need to do. So why do we not apply the same principles to the cervical muscles? There is absolutely NO reason why! Dogmatic teachings has led both doctors and MSK therapists to believe that these muscles just need to be released, and not strengthened. This is pure iatrogenic treatment, only to exacerbate the patient’s already horribly injured musculature! Some patients get a hyperflexion injury, damaging their extensors such as the trapezius, levator scapulae and spinal extensors. With hyperextension, commonly the sternocleidomastoid, scalenes, longus capitis and longus colli, and even infrahyoidal muscles may get injured. If they become completely torn, this is usually spotted with MRI, and if not, it may be found with ultrasound. However, most of the time, they are only partially injured, but sufficiently so to the degree of utter inhibition and tissue wasting. The only way to manage and cure this, in my experience, is to gradually strengthen the muscles. This is a very painful process, yet a very effective process. It is important, though, that the exercises performed must be individualized. Use provocative testing to find the muscles that are dysfunctional, and treat them. The exercises must be performed with utmost caution, as even low intensities can dramatically increase the patient’s pain levels to such a degree that they have significant regression. This is not dangerous, and it will subside, but it is unnecessary, and it will scare the patient. Let me tell you a story to illustrate what small volumes of exercise we are talking about! A 45 year old man came to my clinic in the summer of 2017. He had suffered a skiing accident that winter, resulting in whiplash. Post injury he had an MRI which was fine, no fractures nor significant damage was seen. He was sent home. Shortly after, tremendous pain started onsetting. Chronic debilitating headaches, dizziness, significant cervical restrictions and pain to the degree of disability; he had to go into sick leave for an uncertain duration. When he came to my clinic, he was in severe pain, and had been taking 4+ strong painkillers every day for the last 7 months. He was unable to work nor exercise, and was resting in great periods of the day to be able to cope. When I examined him, I found that he had swayback posture with depressed scapulae, forward head posture with hinging, thoracic outlet syndrome, costoclavicular space compression, and significant musculature wasting in the cervical region; especially the posterior side. No significant atlas torsion was noted; probably because it was ‘only’ 7 months post accident. Moreover, by squeezing into the trapezius, levator scapulae, SCM and suboccipitals, I could reproduce the headaches he had been experiencing. My examination alone (which in reality wasn’t that brutal) was so painful for the patient, despite having taken several pain killers that day, that he was much worse when he left than when he came. I sent him off with initial correctives regarding posture (get pelvis backward, long neck, raise scapulae), as well as some simple exercises for the trapezius and SCMs, to begin with. After three weeks this gentleman, who is a police officer of the rougher sort, emailed me and let me know that he had to stop doing the exercises as it was just way too painful, «even for a pain lover» such as him, he said. I asked him which exercise was the problem, and he said that the shrugs were especially painful. He could barely sleep for days after doing these exercises. This, friends, is why people dare not to do exercises with neck injured patients! I told him: «NO, you have to keep going. If you can not do more than 8 repetitions with a 10lb dumbbell, this means that the work capacity of this muscle is extremely low, and it also means that this is undoubtedly the main cause of your pain. Let us compromise; keep doing the exercises, but drop the volume to 2 repetitions per day.». Reluctantly, he agreed. Please note that we hadn’t even started with the levator scapulae, scalenes nor suboccipitals yet! Three weeks later, he emailed me again. He told me that he had been gradually increasing it to 16 lbs and now 8 repetitions again, almost pain free. He had also reduced his pain killer dosage to 3 pills rather than 4. After 4 more weeks, he had cut the pain killers down to 2 pills, and the headaches were completely gone. At this point I prescribed exercises for the suboccipitals, levator scapulae and scalene complex. And 8 weeks after that, again, he had completely stopped pain killers, and was back at work (partially, working 30%). I reexamined him and found that almost all of the structures of his neck was both thicker, and no longer painful to squeeze into. The thoracic outlet problem was the only thing remaining, and was still restricting movement of the neck and contributing to pain, but it is much better than it was. Imagine if we had given up! This patient is almost cured at this point, from the «uncurable disease». It is not uncurable at all, we just need to be patient and start slowly, with a common sense approach. The interesting thing is that his general physician strongly discouraged him to follow my exercise regimen, and told him to go get massages instead. He also called me a charlatan (which is fine, I know that this is controversial, so I did not take it personally). But, after seeing the great improvements that my patient had, he turned 180˚ and told him that he was now considering sending other patients to me! The point is that therapists are so extremely afraid to make patients worse. The main reason for this fear, is that they do not know what is causing the pain in the first place, which of course makes ‘doing anything’ more scary than it really is. The approach outlined in this article helps you to identify the underlying causes of the pain, which will greatly increase your confident as well as your expectations toward the rehabilitative protocol that is initiated. In this case, I knew that the patient was going to get worse; muscles always get worse before they get better. But they will get better, and eventually completely cured. Where as, in strict contrast, massages and similar make it immediately, temporarily better, but ultimately exacerbate the condition by stretching out the poor, injured muscles further. Whiplash injuries are treatable! Injured muscles require strengthening, not release work! Just make sure that you start very, very lightly and easily, gradually increasing the loads and volume of the exercises only when such is indicated by positive progress. It was difficult to write this article, because the topics are so many, and I could impossibly expand upon all of them. I am happy that I’ve already written most of the required linkable material. Neck pain is, after all, highly controversial. Its treatment may be perceived as counterintuitive, which is also why, as I see it, the evidence is so extremely conflicting on this topic in specific. I do think that a problem that is so highly multifactorial, will almost inevitably become diffuse and controversial. Many differential issues may cause and contribute to neck pain, such as scapular dyskinesis, thoracic outlet syndrome, atlas dysfunction, whiplash (duh), muscular dysfunction, discogenic pain, disc herniations, and more. Learning to identify the most probable cause(s) and treating it properly, will highly increase the likelihood of success, often with lasting results. I hope to have collected and expounded these many factors in a way that was understandable to you, the reader. I truly believe that the causes mentioned in this article, accounts for most of the chronic neck pain that we see in our patients. If you can identify and correct these, even if other more complex aetiologies are missed, the patient will most almost inevitably better. The reason is that the above mentioned problems cause chain effects of dysfunction, and when resolved, even the things you may have missed may improve on its own.